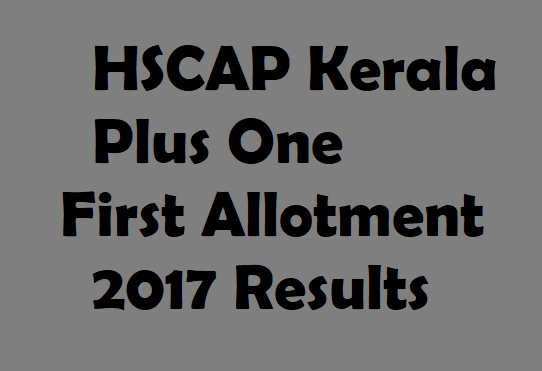 Kerala Plus One First Allotment 2017 HSCAP results declared. The admission dates are 19th & 20th June, 2017. Complete details regarding HSCAP Plus One +1 Allotment are available on the official website at hscap.kerala.gov.in. The Directorate of Higher Secondary Education had given the exam need to pay the fee for admissions into Higher Secondary Education before 5 PM. HSCAP Plus One +1 Allotment will be available from June 19. The Higher Secondary Education-Single Window Admission 2017-18 statistics is nearly 496347 students applied from 14 districts, Total seat allotted 237920, total seats are 288954, and total vacancy is 51034. The Higher Secondary Centralized Allotment Process has published the HSCAP Kerala Plus One First Allotment 2017 today.Aspirants have to pay the fee before 5 PM, June 20. The Kerala Plus One Allotment Result are available on its official portal at hscap.kerala.gov.in. The admissions are clear in the online. Please do complete the process on June 19 & 20, 2017. Students and their parents have to check HSCAP Kerala Plus One First Allotment 2017 process from the official portal and should complete on or before 19 & 20 June. The allotted seats have to follow the instructions from online for admissions.